Just as it is important for seniors to engage in regular physical activity in order to keep their bones and muscles (and their brains!) strong, so too should they engage in stimulating activities such as brain exercises to maintain their brain health. 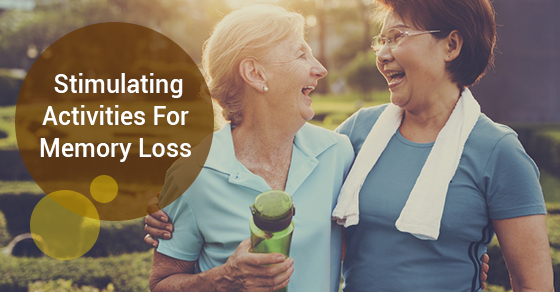 This is important to mitigate the natural memory loss that comes with aging. Even if the individual is experiencing more severe memory loss, such as dementia, all of the following brain exercises, especially those that focus on things in the real world, can be effective. With that, here are a few stimulating activities that can help improve memory. Word GamesThe newspaper is a great place to find word games such as sudoku and crossword puzzles. The key is to find a challenging game; otherwise it will simply not offer as many benefits. Test YourselfPractise your recall when at home. For example, make a list of items, whether it’s a list of things to accomplish or a list of items you need to pick up from the grocery store and then return to the list an hour later to see how many things you can remember. When eating dinner, try to identify all of the ingredients in your particular meal. Again, testing yourself should be a challenge. Take Advantage of Real-World SituationsFor example, do the math in your head whenever situations involving math arise, such as when figuring out the total cost of items in your grocery cart. If it is still safe to drive, consider taking a new route home. Brush your teeth with your other hand! Learn Something NewStudies show that learning something new over a long period of time is particularly beneficial for the aging brain, as well as improving memory loss in those with dementia. This could mean learning to play a new instrument, a new sport such as yoga or golf or even a new language. Taking a cooking class is also beneficial as all of the senses involved in the act of cooking stimulate different portions of the brain. Another alternative is to play bridge. Work On Your Fine Motor SkillsFor example, take up knitting or drawing, or work on a puzzle. SocializeEven socializing can be a stimulating activity for those with memory loss. Those with memory loss could benefit greatly from home care services. C-Care Health Services offers a variety of affordable and high-quality services. Contact us today for more.